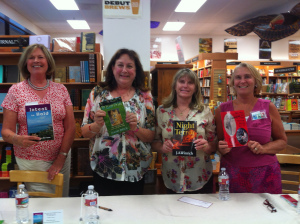 Again we had another great Hot Summer Nights reading at Copperfield’s Books and co-hosted by Redwood Writers. Thank you to Copperfield’s for the superb location! 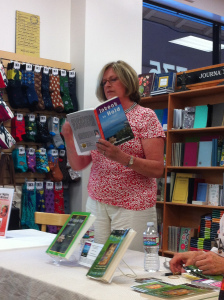 Last night I read from my book, Intent to Hold, at Copperfield’s Books in Santa Rosa. Copperfield’s is a thriving indie bookstore with seven stores spread over three counties in the North Bay Area. Every August in partnership with Redwood Writers Club, four authors read from their works at an event called “Hot August Nights.” Readings are held on Tuesday evenings and are free to the public. Last night, of a group of twenty or so, eleven were my family and friends. What a turn-out! I was so pleased to see friends from my years at Petaluma PD and two members of my critique group as well as my sisters. What a great evening! Thanks for the re-post, Robin! You missed a terrific evening! 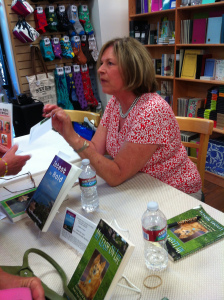 Congratulations to Thonie and all the other wonderful writer/readers that celebrated Hot Summer Nights. I was so proud to be in the company of Natasha Yim, Charles Markee, and Sandy Baker when we shared our children’s books at a previous Hot Summer Nights. I commend the Montgomery Village Copperfield’s for celebrating our local authors.